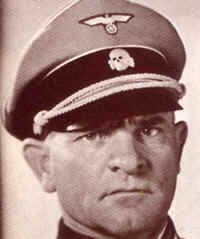 Citation: C N Trueman "Sepp Dietrich"
Sepp Dietrich was a senior SS figure in Nazi Germany. During World War Two, Dietrich was a successful military commander fighting in Russia and leading one of the main attacks in the Battle of the Bulge (the Ardennes Offensive of 1944–45). After World War One ended, Dietrich, disillusioned with the peace, joined the Freikorps (Free Corps); a group of ex-soldiers who were determined to overthrow the Weimar government they believed had betrayed the German military. The Freikorps gained a reputation for its brutality, especially when it put down a communist government that had taken over Munich.Dietrich was born in Bavaria in May 1892. He fought with bravery during World War One, and he was a crewman in one of the first German tanks to fight in the war. Joining the Nazi Party was a natural move for Dietrich. In Hitler he heard all what he needed to hear – the causes of Germany’s troubles and what to do about them. In 1928, Dietrich joined the SS and he became one of Hitler’s personal bodyguards. However, in 1928, the Nazi Party was still a minor player in the Reichstag with just 12 elected members to the Reichstag – compared to the Communist Party’s 54 members. The depression and the subsequent unemployment it created was the making of the Nazi Party. Its rise to power, and the appointment of Hitler as chancellor in January 1933, inevitably led to a rise in Dietrich’s status. Dietrich became a member of Hitler’s inner circle of advisors. He accompanied Hitler when he made visits and was in a position where he could express his views to Hitler – which few other people could. Dietrich was given the task of creating an elite within the SS. This was the SS Watch Battalion -Berlin, which later became the SS Leibstandarte Adolf Hitler – one of just two units that was allowed to have the name Adolf Hitler in it. Dietrich, himself, was made head of Hitler’s personal security and it was in this capacity that he took part in the murderous attack on the SA’s leadership in the Night of the Long Knives in 1934. In July 1934, Dietrich was made SS Obergruppenfuehrer, the equivalent of a full army general. Unlike many in the SS, Dietrich was well regarded by the army. General von Fritsch gave him personal instructions on war strategy as seen by the army and Dietrich determined to make the SS Leibstandarte Adolf Hitler into an elite combat unit. In the spring of 1940, Dietrich and the SS Leibstandarte Adolf Hitler took part in the Blitzkrieg attack onFrance and the unit played a major role in pushing the Allied forces back to the beaches of Dunkirk. The more successful Dietrich was, the more he went up in the mind of Hitler. Dietrich was personally handed the Knight’s Cross of the Iron Cross by Hitler in 1940. The SS Leibstandarte Adolf Hitler took part in the attack on Greece and Yugoslavia. It was also given a role in Operation Barbarossa – the attack on Russia. It was in the retreat that the German Army made after Stalingrad, that Dietrich showed real skill as a leader saving his unit at least seven times with skilful tactical withdrawals. Though Dietrich was a devoted follower of Hitler, he also displayed some independence from the classic SS image. He did little to disguise his contempt for Himmler, head of the SS, and he personally protested to Hitler on two occasions about the shooting of Jews. In some sense, he was more senior army officer than senior SS leader. His performance in Russia was such that Hitler awarded him the Swords to the Knight’s Cross – just the 26th man to be awarded this medal from September 1939. In June 1944, Dietrich was given command of the SS 1st Panzer Division which fought in the campaign in Normandy. It was during this campaign that he made it very obvious that he did not agree with Hitler’s strategy. Dietrich wanted to make a tactical withdrawal to territory that he felt he was better able to defend. Hitler refused to sanction this, seeing it as an act of retreat – something he could not envisage for the SS. Did Dietrich get involved in what was to be the July Bomb Plot of 1944? Rommel, in a conversation with his adjutant Lang, claimed that Dietrich had told him that he would be prepared to follow Rommel’s orders first, even if they differed from Hitler’s. However, when the Bomb Plot occurred, Dietrich expressed his outrage and claimed that it would throw the whole German military into chaos. If Dietrich was implicated in the early days of the conspiracy, he got away with it and Hitler never lost faith in the ability of Dietrich. Hitler entrusted the success of the Ardennes Offensive (the Battle of the Bulge) to Dietrich who was given the command of the Sixth Panzer Army. The attack against the Allies was remarkably successful to start with but a shortage of fuel led to the attack literally grinding to a halt. Dietrich was then sent to fight the advancing Red Army. His last battle was against the Russians at Vienna where he failed to stop the Russians taking the city. Dietrich surrendered his army to the Americans on May 8th 1945. Dietrich was put on trial for complicity in the Malmédy Massacre during the Battle of the Bulge. Though his direct involvement was never proved, Dietrich was sentenced to life in prison for “offences against customs and ethics of war”. Many senior German army officers came to his defence and the sentence was cut to 25 years. Dietrich was released in 1955 but was re-arrested and charged with taking part in the murders during the Night of the Long Knives of 1934. For this, he got an 18 months prison sentence. He was released in February 1958. Sepp Dietrich died of a heart attack on April 21st 1966.